The results? 14 million people, a fifth of the population, live in poverty. 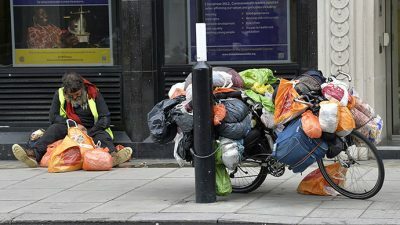 The widely respected Institute for Fiscal Studies predicts a 7% rise in child poverty between 2015 and 2022, and various sources predict child poverty rates of as high as 40%.3 For almost one in every two children to be poor in twenty-first century Britain is not just a disgrace, but a social calamity and an economic disaster, all rolled into one. But Universal Credit and the other far-reaching changes to the role of government in supporting people in distress are almost always ‘sold’ as being part of an unavoidable program of fiscal ‘austerity’, needed to save the country from bankruptcy. In fact, however, the reforms have almost certainly cost the country far more than their proponents will admit. The many billions advertised as having been extracted from the benefits system since 2010 have been offset by the additional resources required to fund emergency services by families and the community, by local government, by doctors and hospital accident and emergency centres, and even by the ever- shrinking and under-funded police force.